While everyone has heard of the late actress Elizabeth Taylor, did you know that she fell in love with Puerto Vallarta and even lived in the area for many years? During the l1960’s, Elizabeth Taylor filmed a movie in Puerto Vallarta called Night of the Iguana. At that time, she was charmed by the local people, the spectacular Banderas Bay, and the beautiful lush vegetation that Puerto Vallarta is known for. Consequently, she ended up owning a home in the Gringo Gulch area of Puerto Vallarta where she resided for many years. Today, her former home is now a boutique hotel and fine dining restaurant so you can see how she lived. 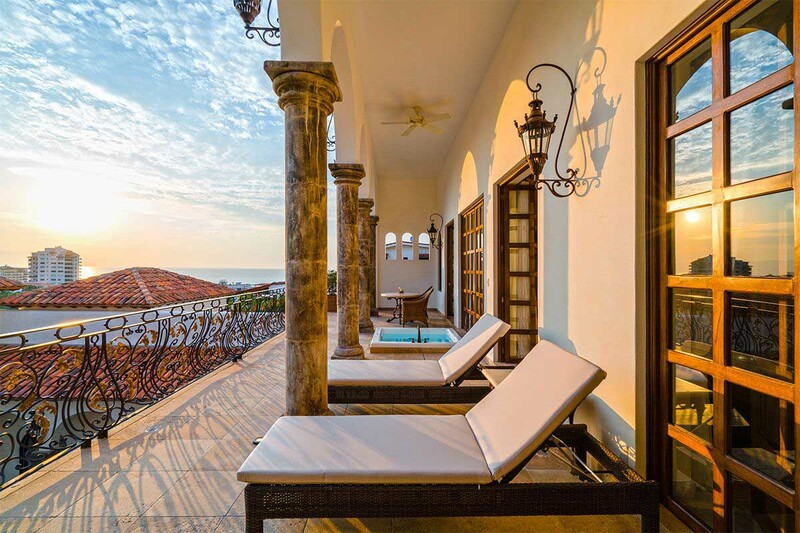 Continue reading below to learn more about the elegant and regal Casa Kimberly, so you can make sure to stop in during your next visit to Puerto Vallarta. The romantic love story of Elizabeth Taylor’s romance with Puerto Vallarta at Casa Kimberly begins in 1962 when actor Richard Burton arrived in the area to film John Huston’s classic, The Night of the Iguana. Incidentally, Burton and Taylor had actually met each other a few years prior when they filmed the movie Cleopatra. Although they were both married to other people, they began a scandalous affair and epic romance. The story goes that Burton lived across the street from Casa Kimberly where Taylor was staying during filming, and built a 2nd story bridge above the street to connect the two homes. It was a perfect way to maintain privacy and escape the prying eyes of the paparazzi. Later, Burton gave Casa Kimberly as a 32nd birthday present to Taylor in 1964. The couple later married and divorced each other twice and had a spirited and passionate love story that put Puerto Vallarta on the map. Today, the former home of Elizabeth Taylor operates as an elegant boutique hotel and open air restaurant. The homes of Burton and Taylor were combined to create nine luxury suites, a spa, and pool. The Puente Del Amor (Bridge of Love) was preserved so that visitors today can walk the bridge just as Burton and Taylor did decades ago. One of the hotel suites boasts a pink marble heart-shaped tub that was personally commissioned by Taylor as well as the exact lozenge-shape pool she and Burton regularly swam in. Each of the nine suites were individually designed and appointed with exquisite antiques, crystal chandeliers, hand-painted tiles, and elegant bathrooms. 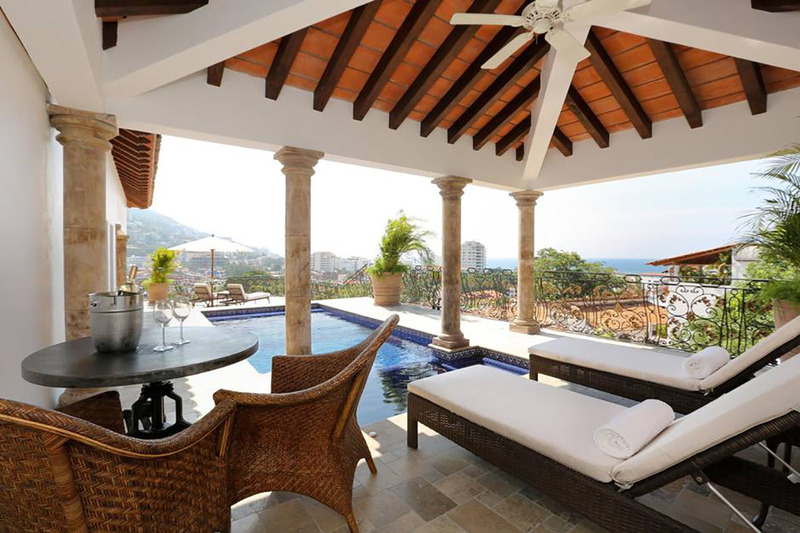 Suites also include spacious patios with jacuzzis and plunge pools so guests can enjoy a refreshing dip as they take in Puerto Vallarta’s breathtaking city and ocean views. There is also a Spa on site that offers custom treatments so you can pamper yourself just like Taylor did. 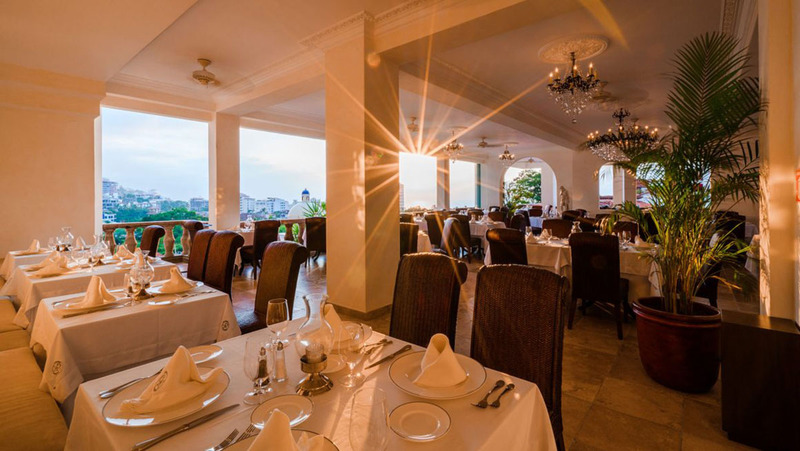 In addition to the hotel suites, the Iguana Restaurant is a fine dining option that is a must try for anyone that find themselves in Puerto Vallarta. Seating options fill the oversized patio area and there is a tequila bar on site as well. During high season for 6 nights a week, you are treated to the sounds of a dramatic mariachi band that passionately sing and liven up the stately ambiance as you dine. The Iguana Restaurant’s Executive Chef is Eduardo Michaga Lucero who put together an unique menu combining traditional Mexican dishes with a modern twist. The menu focuses on fresh and local ingredients, and the tequila bar offers an excellent variety of top flight tequilas and mezcals that are all from the Jalisco region. Sparkling views of Banderas Bay, Puerto Vallarta’s city skyline views, and the lush vegetation of the Sierra Madre Mountains creates an unforgettable dining experience you will cherish for years to come. Make sure to book a reservation to stay or dine at Casa Kimberly where the opulent lifestyles of Elizabeth Taylor and Richard Burton have been recreated for today’s modern luxury travelers. It truly is an experience like no other where you can step back in time and relive how cinematic royalty spent their time in Puerto Vallarta. Celebrate St. Patrick’s Day in Mexico! Puerto Vallarta , JAL. , 48390, México.